Sweet potatoes (Ipomoea batatas) are warm-season plants in the morning glory family (Convulvulaceae). The part we eat is the fleshy storage root of the plant, which is a little different than the regular Irish, or white, potato (Solanum tuberosum), a plant in the family Solanaceae. 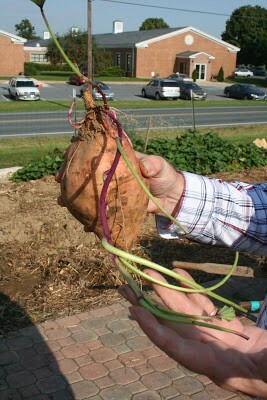 In that case, the part we eat is a fleshy underground stem of the plant, called a tuber. 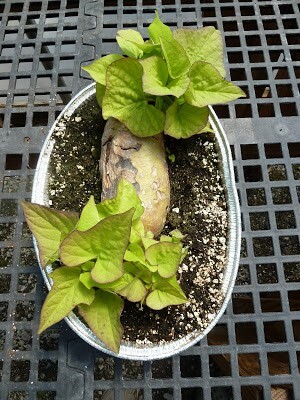 Although sweet potato roots continue to grow until frost kills the vines, an extremely hard frost can cause damage to the ones near the surface. Chilling injury also results when soil temperatures drop to 50°F or lower, and this can result in internal decay in storage. The greatest danger from delayed digging is the risk of cold, wet soil encouraging decay. So the best time to dig is around the time of first frost in your area, or shortly thereafter. The vines can be clipped approximately 5 days before digging to improve skin-set or reduce the incidence of skinning the roots during harvest. To avoid exceptionally large sweet potatoes, a few hills should be dug in advance of the anticipated harvest date to determine the size of the sweet potato roots. You can cook newly dug sweet potatoes right away, but their flavor, color and storage quality is greatly improved by curing at warm temperatures immediately after harvest. It is during the curing process that starch is converted to sugar. Cure sweet potatoes by holding them for about 10 days at 80-85°F and high relative humidity (85-90 percent). Commercial producers have temperature and humidity controlled housing to guarantee good results, but for the home grower, they can be cured near a furnace or heat source to provide the necessary warmth. If the temperature near your furnace is between 65-75°F, the curing period should last 2-3 weeks. To maintain the required high humidity (85-90 percent relative humidity), stack storage crates or boxes and cover them with paper or heavy cloth. Once the sweet potatoes are cured, move them to a dark location where a temperature of about 55-60°F can be maintained, like an unheated basement, or root cellar. Sweet potatoes are subject to chilling injury, so don’t refrigerate them. Outdoor pits are not recommended for storage because the dampness encourages decay. Good results can be obtained by wrapping cured sweet potatoes in newspaper and storing them in a cool closet. 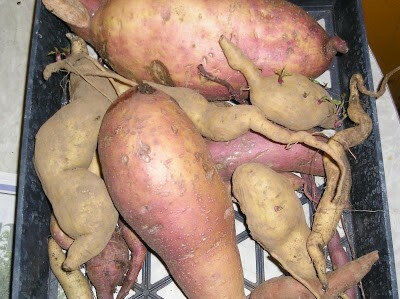 Sweet potatoes can also be stored in sand. Have you ever wondered what, if any, is the difference between the ornamental sweet potato vines grown as a season-long ground cover, or, as “spillers” in container arrangements, and the vegetable we grow as food? The answer is – not much. They are just different cultivars of the same plant species, Ipomoea batatas. The ones we grow for food are selected and bred to produce large, uniform, good tasting roots, high in nutrients for eating, whereas the ones we grow ornamentally are selected for the striking shapes and colors of their leaves. Plant breeders introduce new variations every year. If you dig up the earth around your ornamental vines, you’ll find the same fleshy roots (different colors, perhaps) as the familiar ones we grow, or buy, for food. So, can you eat them? Well, technically, yes – but there’s no guarantee how they’ll taste. Most ornamental varieties are pretty bland. However, if you dig, cure, and store them as above, it’s possible they can stay viable until spring, when you can try to continue their growth for another season. Ray Eckhart is a former Penn State Extension Educator and avid home vegetable grower, with a weakness, bordering on obsession, for home grown tomatoes. So what about those of us who really don’t have a place to cure them? Will the starches eventually convert to sugar over time, anyway? Is there a rule of thumb temperature-time ratio that can give me a rough idea of how long to wait? How critical is the humidity level in this process, or is that only important for sealing cuts, and such? I live in SE Michigan, pulled my sweets in the first week of October, and just put them in a crate in a room where the temps probably range from 55-75 degrees. I just baked the first ones yesterday (12/5), and they were pretty bland. Would it make a difference if I waited longer? Would doing the curing thing at this stage accomplish anything? I would truly appreciate any advice you could give me. Thanks! Good question. I had to research a bit to find a good answer, since there’s not a whole lot on what to do if you haven’t cured. According to this link to a Google Book excerpt, the roots are still living tissue, and the starch to sugar conversion will continue, even if the roots haven’t been cured, but it will take longer. There are some tables in the book that document the results of some studies that measure the rate of conversion, according to time, temperature, and humidity, also with the caveat that different cultivars may react differently. At this point, I would not try to cure them, since raising them back up to the higher temperatures and increased humidity described in the post, may trigger a response to send out new shoots. I hope this helps, and if any other folks out there have more information, I welcome clarifications or better understanding. The plant falls into the category of deciduous, tropical, and perennial. The purpose of the curing is speed up the reactions that would normally occur during the plant’s preparation for dormancy, and to then keep them in that state for as long as possible for storage for our use purposes. The process of starting new plants from the old roots is mimicking the conditions where the plant would break dormancy, and send out new leaves, roots, etc. for a new season. Some great information can be found by starting at this link and going on for awhile exploring by clicking on the embedded links to more information. Correction (after spending some time at the bioweb link) – “herbaceous” is a better term than “deciduous” for this plant. Thank you for your answer! From the literature you gave me, it looks like conversion from starch to sugars does continue during storage, so it seems they will keep on getting at least somewhat better. It also appears that even if curing conditions aren’t “ideal”, if the sweets are held in even some extended rise in temperature after harvesting that would help. Maybe I’ll see if I can try that next year. I especially appreciate the information about trying to cure them now — knowing that they would break dormancy makes that decision real easy! One thing that occurs to me is that their blah-ness may be as much a result of their growing conditions as anything else. We had a very cool, wet summer this year with temps only ever getting into the 80’s, and my total harvest was much smaller than I had expected. I wonder if this also affected the flavor of the roots that formed. I have been thinking, next year, of growing them under a hoop house, or something like that, to give them added growing warmth. Previous Previous post: You CAN grow it, but is it worth it?